Princeton NJ -- Professor Eduardo Cadava works at the intersection of disciplines. While he is a member of the English department, he also is the dissertation adviser for nine students in four other academic departments; holds the position of associate member of the School of Architecture and the German and comparative literature departments; and explores disparate subjects in his scholarly work that include photography, mourning and even 19th-century fertilizer importation. 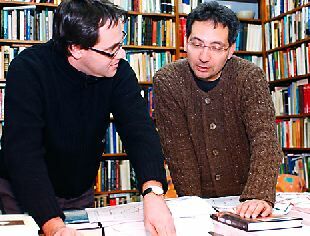 English professor Eduardo Cadava (right) delves into a wide range of subjects in his scholarly work. He also is an associate member of the architecture, German and comparative literature faculties and advises 16 doctoral students in five academic departments. Here, he discusses a project with Rafi Segal, a Ph.D. student in architecture. His work draws from literature in American, English, French, German, Spanish, Greek and Arabic, and spans several disciplines, including philosophy, history, politics, photography and the natural sciences. "Nothing happens in isolation," Cadava said. "I'm very interested in thinking about the relation between literature and these other disciplines, between literature and the arts, between literature and technology. One of the things that makes literature literature is that it's never just about itself. It's always touched by history, politics, economics and religion." Kerry Bystrom, a fourth-year Ph.D. student in English, said of Cadava, "I think it is really important for the English department to have professors like Eduardo, who go out and make connections with work being done in other fields. He has an expansive sense about what the study of literature should be, and this openness helps create links between students and faculty in different departments and different periods of specialization that are very fruitful." Cadava was drawn to interdisciplinary work because of his close study of two writers, Walter Benjamin and Ralph Waldo Emerson, whose work ranges across several disciplines and establishes connections between them. Cadava has written at length about Emerson and teaches an undergraduate course in the Program in American Studies called "The Age of Emerson." Students in the class read a wide variety of texts to delve into Emerson's references and deeply analyze them. "We can spend three hours on a paragraph, contextualizing the text, discovering how it might evoke and acknowledge its indebtedness to other language while at the same time revising, distorting or mobilizing that language in another direction," said Cadava, who has been on the Princeton faculty since 1989. That close reading of a text was enormously beneficial, said Megan Brown, a member of the class of 2006. "The most valuable lesson I gained from his class was learning how to read -- not only Emerson's writing, but all writing," she said. "He always brought something unique and thought-provoking to the table." Cadava examines another juncture of disciplines in "Genealogies of Memory and Perception: Literature and Photography," a course for graduate students. The class, which has been very popular, looks at moments in literature and philosophy in which writers allude to photography in their attempts to think about the nature of memory and perception. Typically the course enrolls students from several departments and programs, including architecture, English, comparative literature, visual arts, German, French, Spanish and art. "The students bring elements from their own disciplines, which makes the class much richer," Cadava said. Last semester the students were so committed to the class that they established their own discussion section, which met the night before the class, so they would be better prepared. Bystrom, who just completed the course, said Cadava goes out of his way to make people feel comfortable speaking in class -- even when that involves challenging his ideas. "One of the things that really amazes me about him is his encyclopedic knowledge about a huge number of fields -- from 19th-century American and Latin American literatures, to German and French philosophy and South African theater," Bystrom said. "Because he keeps up with so many fields, he is able to synthesize a lot of seemingly disparate information in his classes and present his students with a variety of approaches to every question." Cadava's work on media and photography led to his position as an associate member of the School of Architecture, where he sits on the steering committee of the Program in Media and Modernity, an interdisciplinary program at Princeton devoted to graduate students. The program examines the forms of culture that came to prominence during the last century and looks at the interplay between culture and technology. "Eduardo has the ability to juggle between disciplines and understand the need for cross-connections," said Emmanuel Petit, one of three graduate students in the School of Architecture who are being advised on their dissertations by Cadava. "In his own work, he has searched to make connections between visual material and words; he reads visible material textually. Since I have a topic that touches on philosophy and literary criticism -- 'Irony in Architecture' -- it is crucial for me to have somebody on my advisory committee who is familiar with those areas." Cadava's scholarly pursuits have spanned a number of diverse topics. He has written about the use of meteorological metaphors in Emer-son's meditations on history and politics ("Emerson and the Climates of History," 1997) and the link between photography and history in Benjamin's writings ("Words of Light," 1997). Recently, he also has co-edited a collection of essays on cities and citizenship ("Cities Without Citizens," 2004) and another on human rights ("And Justice for All? : The Claims of Human Rights," 2004). These days he is working on three projects that explore divergent subjects. "Of Mourning," to be published by Harvard University Press in 2005, is a collection of essays that explore the various modes of mourning: individual, collective and national. And Cadava is studying the ephemeral nature of music in a book project called "Music on Bones," which takes its title from a Russian phrase. "It refers to a practice in the 1940s, '50s and '60s when dissidents who wanted to bring banned Western music into Russia would go to hospital trash cans, secure already exposed X-ray film and then press a master disk onto the X-rays to make floppy records," Cadava said. "They were called 'music on bones' because the grooves were on images of chest cavities and spinal columns." The book explores the relationship between music and techniques of production, the history of musical recordings, the history of X-rays and the relationship between music and mourning "because when you experience music, you're experiencing something that is always about to vanish," he said. A reference that mystified him in an essay by Emerson inspired Cadava to delve into research on the 19th-century trade in guano, the excrement of fish-eating birds, which was used in the United States as a highly concentrated fertilizer. The result is a book in progress called "The Guano of History." "I encountered this passage in which Emerson refers to the labor of ethnic minorities in the United States as guano, and I didn't know the reference. Emerson says somewhere that, if you read a sentence properly, it can become as broad as the world, and so I decided to see if I could reconstruct the world that made that line possible," he said. What ensued was 10 years of archival research on guano, which was dug up on islands off the coasts of South America and Africa by convicts and Chinese laborers and shipped to America. "I knew nothing about the trade of guano," said Cadava, who put down Emerson and began reading books with titles like "Guano, Its Origin, Properties, and Uses." Exploring the way Emerson used guano as a metaphor for thinking about trans-national labor, slavery and race became, he said, "a way of engaging debates over identity politics and multiculturalism through a historically based material history." Fertilizer research may seem a bit far afield for an English professor, but, as Cadava explained, "If you want to read something, sometimes this is what you have to do." Deadline. In general, the copy deadline for each issue is the Friday 10 days in advance of the Monday cover date. The deadline for the Bulletin that covers Mar. 8-21 is Friday, Feb. 27. A complete publication schedule is available at deadlines or by calling (609) 258-3601.